It can be quite a scary moment when you hear that loud snap that usually accompanies a garage door spring breaking. After that the next logical thing that comes to your mind is how to repair your broken garage door spring. Depending on your experience with garage doors, repair might even be more frightening due to all the unknowns. Can it be repaired? Which kind of spring is it? How much does it cost? Where can I find a Garage door repair company to fix my broken spring? These are common thoughts, and if you’ve found yourself in this situation, we understand your worries. Your garage door springs are actually more important than you probably think. It’s also important to note that personal injury and property damage are just a couple of the consequences that might befall you if you skimp over garage spring replacement and repair. Thus, taking time to understand the types and workings of garage door springs can help you make more informed decisions. Essentially, there are two main types of garage door springs; Torsion springs and extension springs. If you’re not sure which type of spring your door has, you can find out by simply checking where the springs are installed. Torsion springs are often found on the upper side of the garage door, attached to the header. Extension springs are typically installed on each side of the garage door, mounted to the track. These type of springs work by lifting the door with a pulley and cable system. They move along the track of the garage door, attached to an eye bolt on the structural back hang of the door. They can last up to about 10,000 lift cycles when well maintained. Extension springs are almost at rest when the garage door is completely open and extended fully when the door is closed. If you’re looking for a garage spring replacement, it’s important to understand that not all types of extension springs will work for your garage door. Each door needs a specific pair of extension springs for safe and optimal operation. If you choose the wrong springs, your door might not lift with ease or could potentially cause injury as a result of too much tension. Extension springs have an industry standard where one or both ends of the springs are appropriately color coded to indicate the amount of lifting or pull strength. If you aren’t sure about the weight of your garage door or the color codes, it’s a good idea to seek the help of a professional garage door repair and installation. Extension springs also have cables that run through them known as safety cables. In the event that the spring fails, the safety cable minimizes human injury or property damage by containing the failed or broken spring. It’s a very safe and efficient operating system, but unlike the torsion cables, the extension safety cables are much longer and more exposed to property or persons in the immediate surrounding if they were to fail. If you notice that the safety cables are worn out or broken, be sure to contact professionals for an immediate fix. Torsion springs are a relatively new concept to the garage door industry. The spring is typically mounted to the top of the door and secured to the header with center brackets that secure it in place. There are cables attached to a bracket on each side of the door. A typical single-car garage door has 1 spring while double- car doors usually have 2. The torsion springs assist in lifting the door using a torquing motion after the springs are wound and secured. The cable and pulley system involves two drums and two cables. The spring receives its tension by utilizing a tight-fitting and appropriately sized winding bar to wind up the springs. Considering the technicalities and high risk of injury associated with torsion springs, they should only the installed or replaced by a professional garage door repair company. They need specific tools to wind them and when they are wound, they are always under tremendous tension. If a torsion spring fails, it remains on the tube shaft reducing the risk of flying debris. You can expect about 10,000 cycles from a standard torsion spring, but there are models with longer life expectancy if between 14,000 and 25,000 cycles. 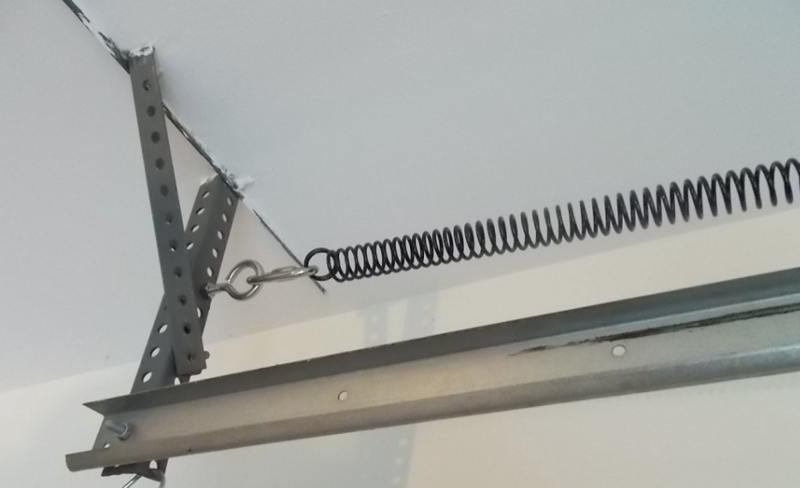 Your garage door spring is a critical component of your garage door. Despite having necessary safety design measures in place, these springs have the potential to cause serious damages when neglected or unprofessionally installed. For this reason, you should occasionally evaluate the doors functionally and look for signs of needed garage door repair, and if you spot any it’s recommended to consult a professional garage door company for proper selection, installation, and repair.